Gay Men To That!! 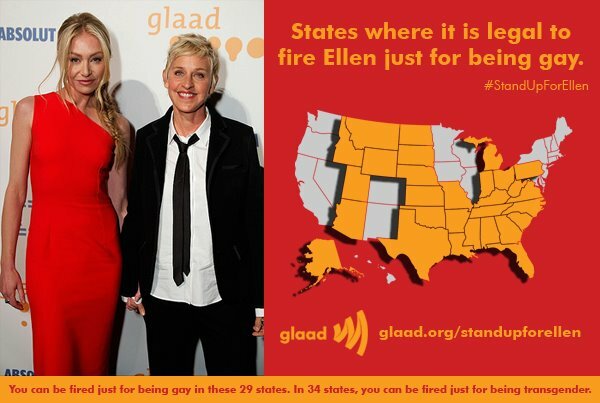 : Gays Can Be Fired In 29 States...Just For Being Gay! Gays Can Be Fired In 29 States...Just For Being Gay! In light of the Ellen/JC Penny non-controversy stirred up by the religious right, it is important to keep this in mind. I have made the point before. I was really surprised that most of my very supportive coworkers did not know this. My boss could walk into our office and say "I am firing you, because you're gay" and their is nothing I could do about it. Not that he would...I work in the adult novelty industry that focuses on both gay and straight customers. I guess that I shouldn’t find it shocking anymore when I speak to people — many progressives, mind you — who have no idea that you can lose your job for being LGBT. As in, if your employer is a homophobe and decides they don’t want to have “that perversion” in their offices, they can call you into their office, or better yet, right into the middle of the office floor and fire you, stating your sexual orientation is the sole reason for showing you the door. Period. And your only infraction might have been the gall to say that you and your partner went to the movies, or by simply displaying a photo of them on your desk. My guess is that average allies (and even way too many LGBTs, sorry to say) not particularly wired into political activism only see the social progress the LGBT equality movement has made that you see in news reports (repeal of DADT, the federal hate crimes law). They don’t notice the lack of consistency in basic civil rights around the country, much of it glossed over by the visible gains in Blue states and municipalities, unless they know someone affected by discrimination. The majority of the states in the U.S. are still state-sanctioned havens for homophobic employers.